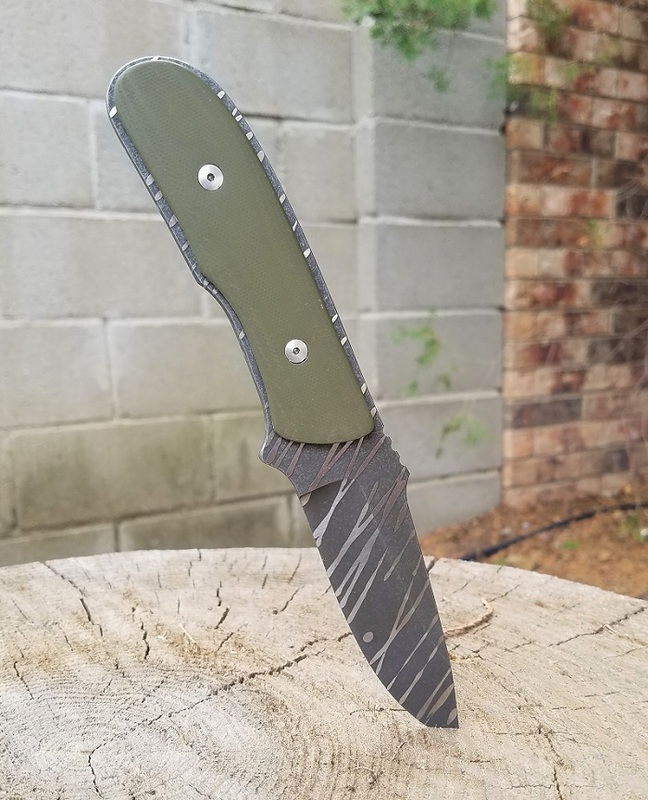 Here's a Scout model with green G-10 and a "tiger stripe" finish. 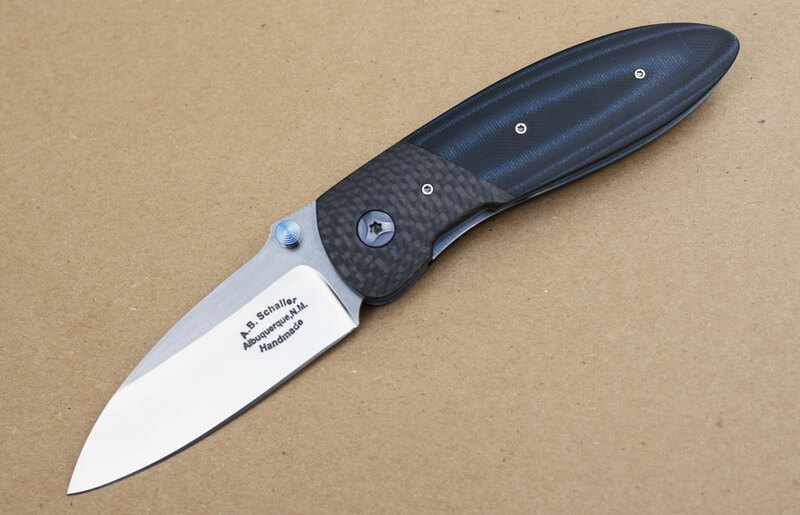 A new Scout model, with acid/stonewashed CPM154 and black G-10. Super light and easy to carry, and super useful, too. I'll have a catalog page up for this model soon. 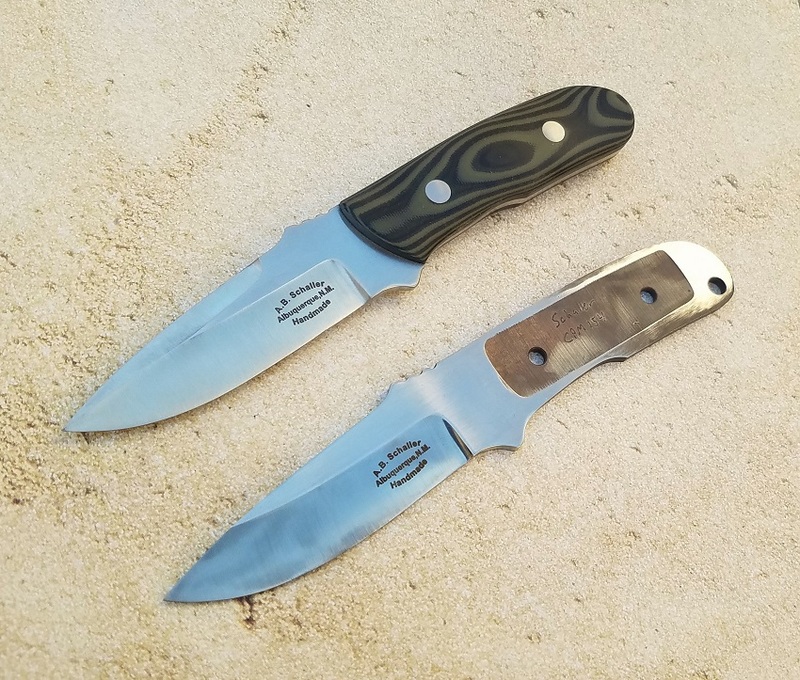 Here are a couple of Companion models, one in Damasteel and one in CPM154 and fileworked, photographed by Jim Cooper (SharpByCoop.) The light/dark woods and the two different mosaic pin styles make a nice contrast. 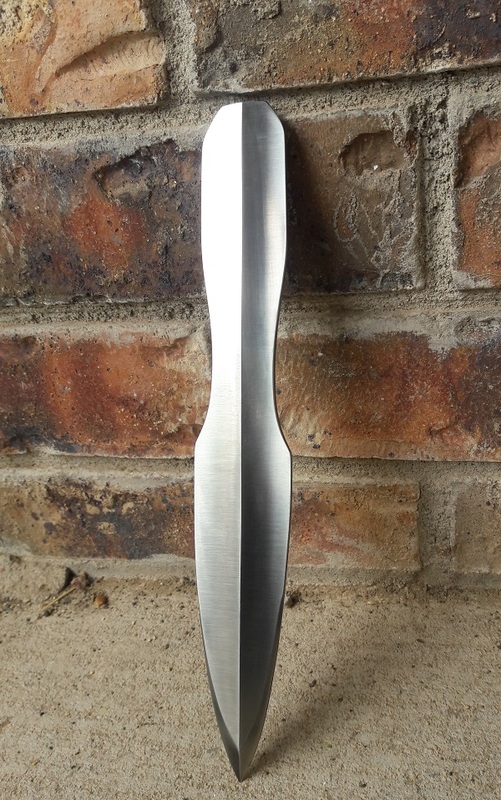 I have several new knives available for immediate delivery - get them before Chrismas! 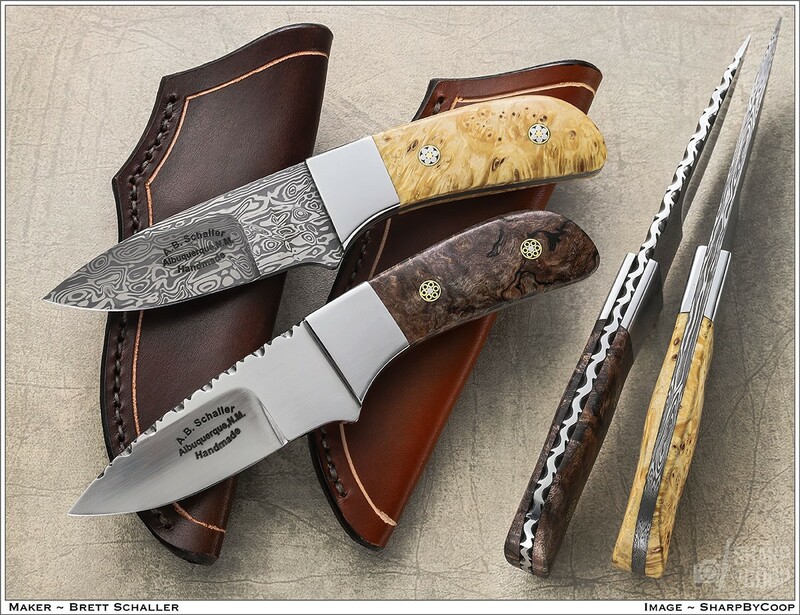 The two new ones below plus the Model 93 from the last update are available - see my Available Knives page for details. A couple of new and different items . 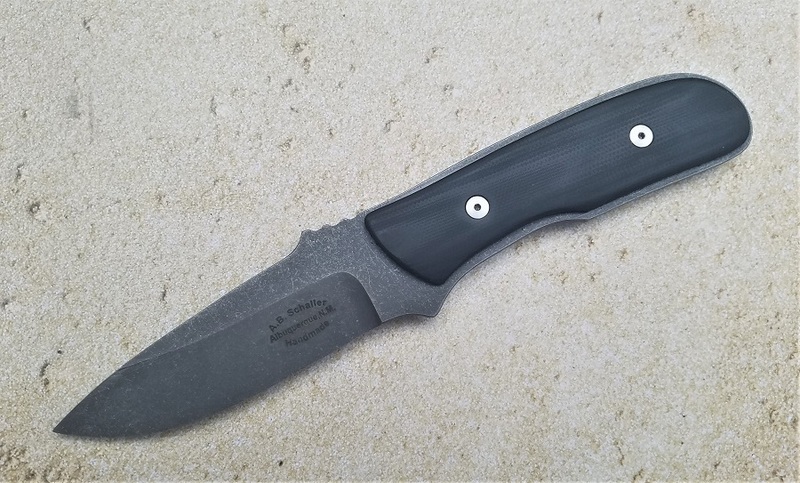 . .
A Goblin II selectively acid etched and stonewashed, with the G-10 scales "shadowboxed."
. . . and a new model, a full tang fighter in 5/32" stock, with a black Micarta guard and green canvas Micarta scales. 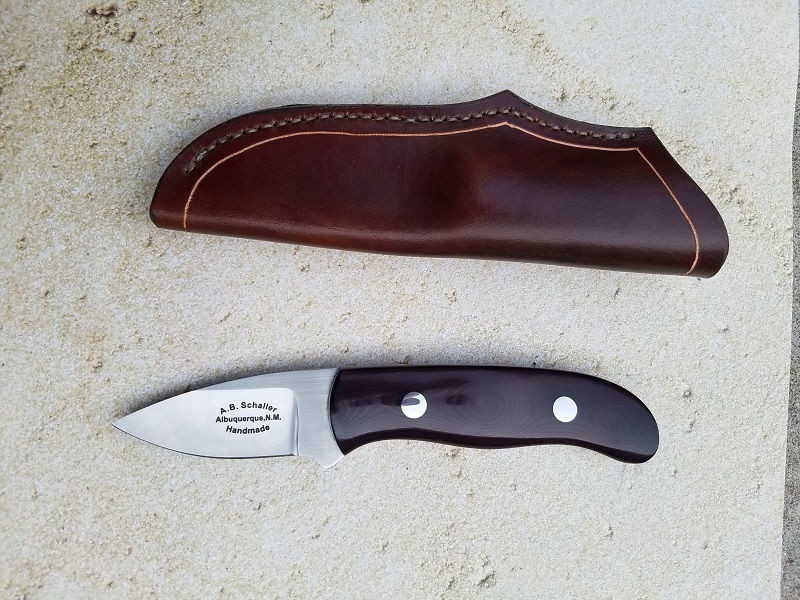 Tapered tang with red liner, and a black leather sheath. This is the all new, completely re-designed Model 93 fighter. Slimmer, sleeker, leaner, and probably a few other words ending in "er"! 5/16" stock, deeply hollow ground both top and bottom with a 3" wheel. Tapered tang. 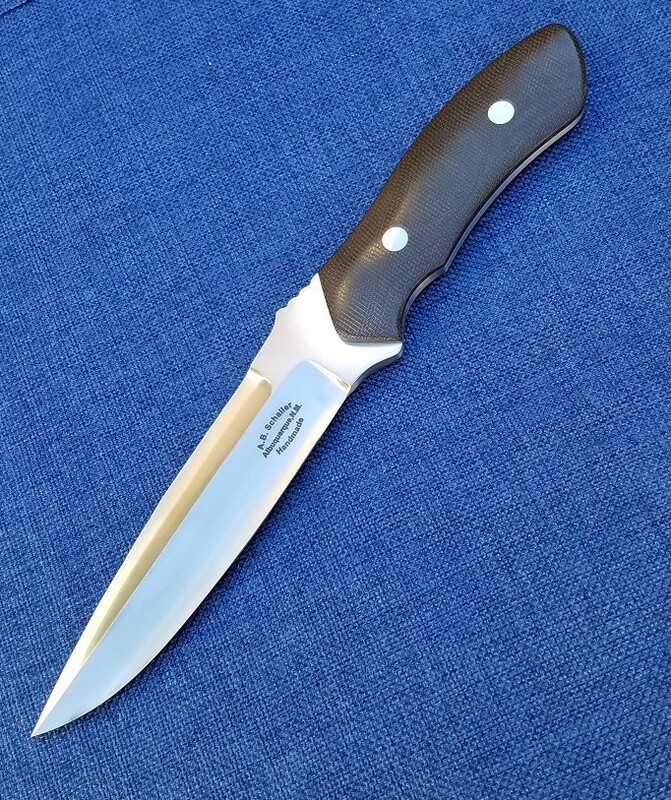 This one features a green canvas Micarta handle. 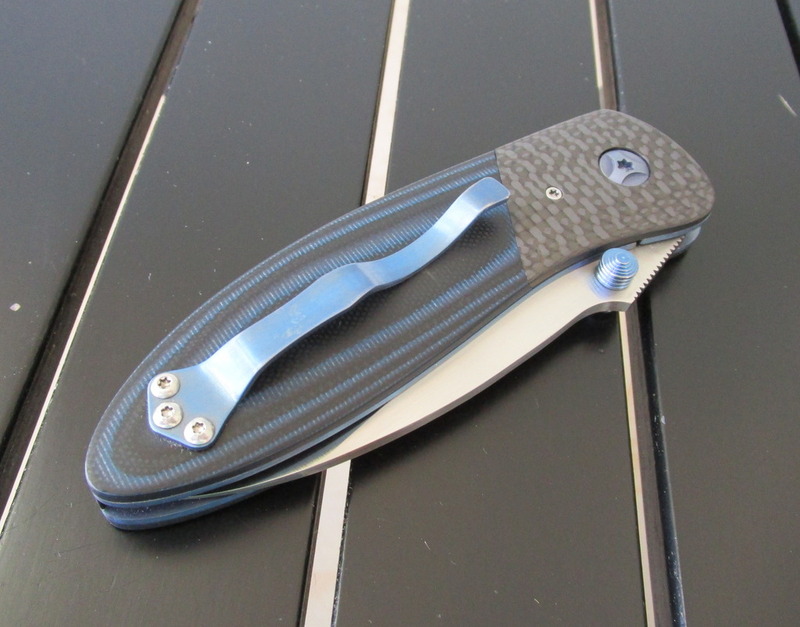 Just finished this one up - a Zephyr folder in locking liner configuration with textured G-10 scales. The blade rides on caged ball bearings. 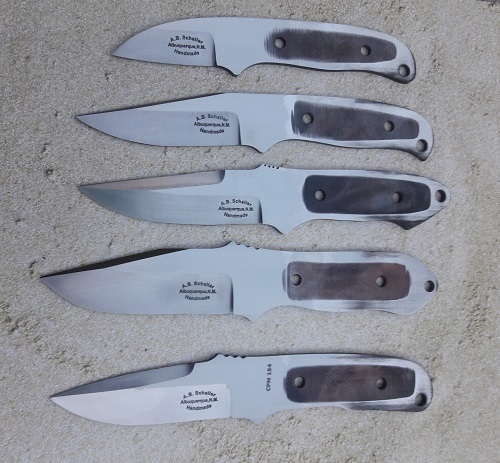 Please check out my "Available Knives" page - I have a couple ready for immediate delivery. 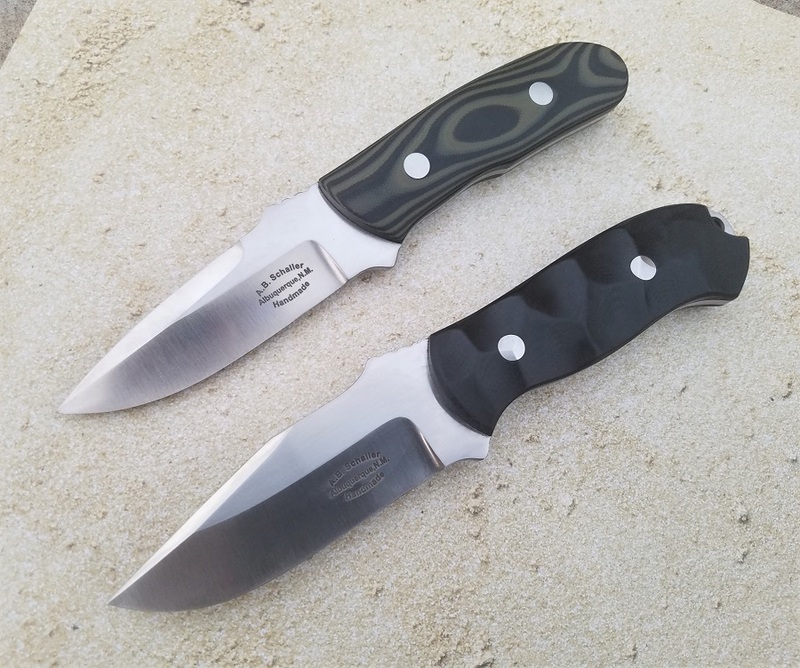 Both the prototype Scout and Ranger models shown here are available, as is the original Ranger with a slightly different handle shape. Not one, but two new models to show you . . . . 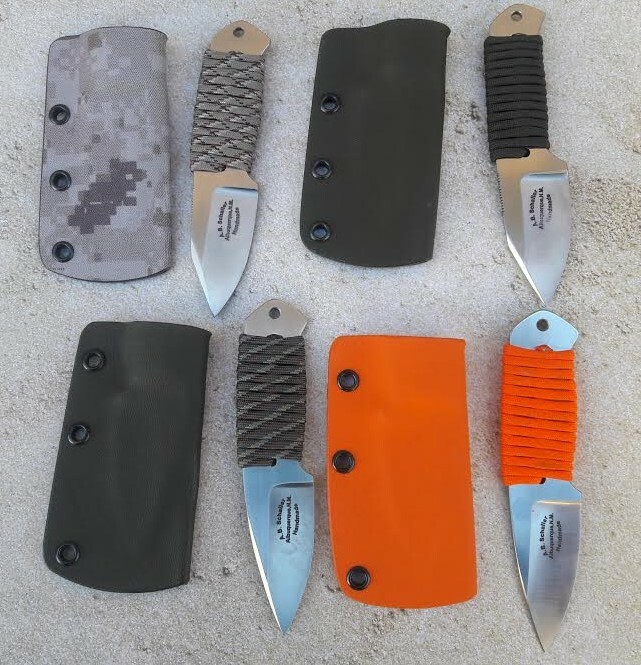 There's an old riddle: Which is the best survival knife? 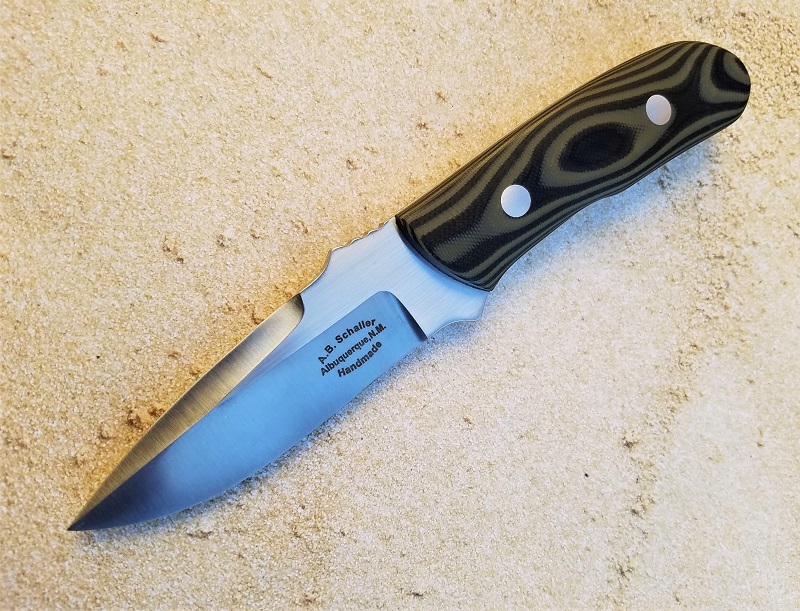 The answer, of course, is your pocketknife – because that's the knife you'll probably be carrying when things go bad, while your 18” hollow-handled custom survival knife is home in your safe because it's too heavy and bulky to carry! 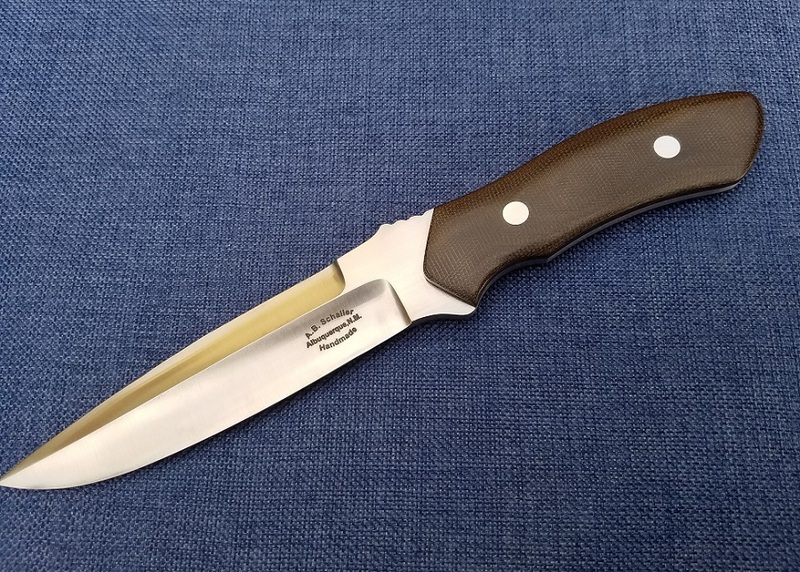 There's certainly some truth to that, so I've always liked the concept of the small survival knife; something just a little more rugged than the usual sporting knife, but still small and light enough to carry when hiking or camping. So I decided to design one. Somehow, I ended up with two. Actually, it's because I took two different approaches to the design and ended up liking them both. Since I couldn't decide which one to add to my catalog, I'm offering both. 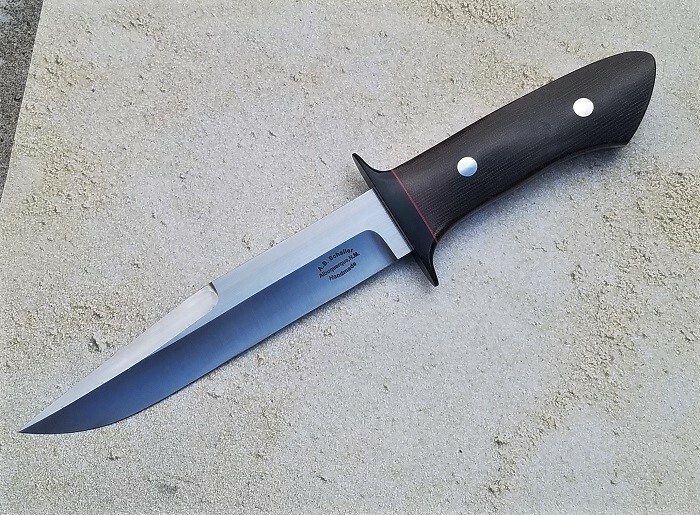 For the first, I started with one of my most popular sporting knives – the Seneca – and redesigned it with 5/32" stock instead of 1/8", a thumb ramp, unsharpened false edge, and a gunstock shaped handle for a secure grip. The result is the Scout, pictured above. I'm going to make it available both with the false edge for a more tactical look and without the false edge for more emphasis on heavy-duty survival. 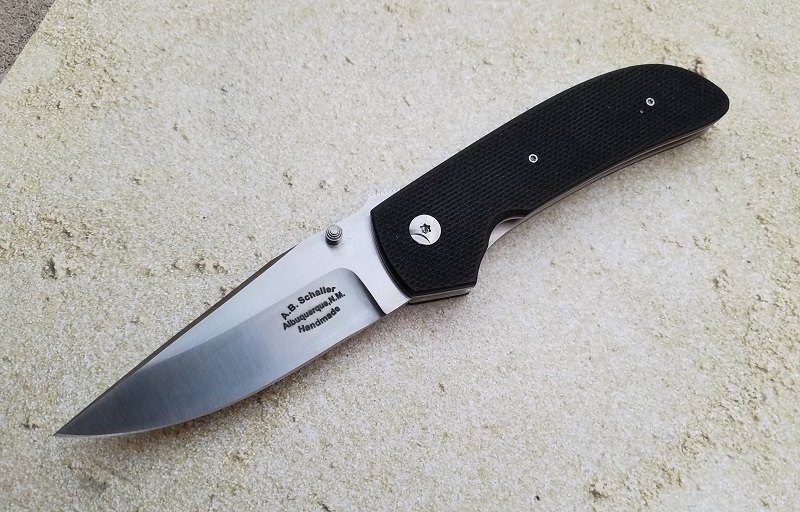 Micarta or G-10 scales standard. 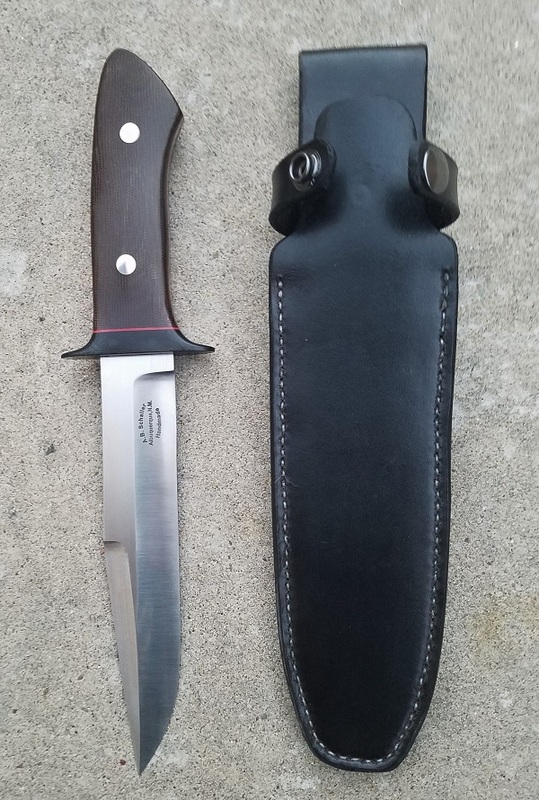 8" overall with a 3 1/2" blade and sporting a Kydex sheath, the Scout will sell for $245. Pictured here below the Scout is the second new model, the Ranger. This one I designed from the ground up for its purpose. Made from 5/32” stock, it's hollow ground on a 10” wheel. The handle is faceted for a comfortable grip that won't shift in your hand during heavy use. The top is beveled at 45 degrees for a sharp point. Exposed thong hole. 8 1/2" overall with a 3 1/2" blade. 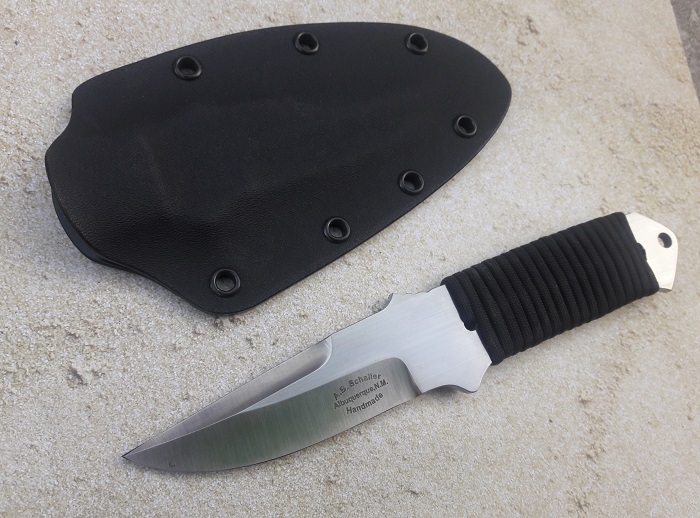 Kydex sheath. 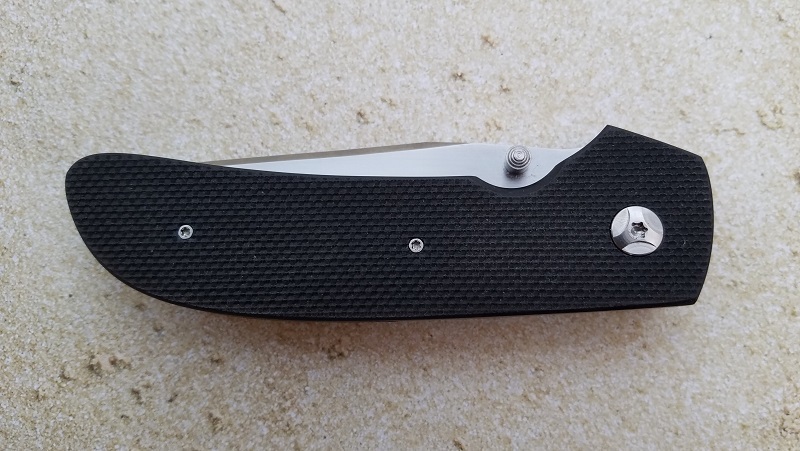 Micarta or G-10 scales standard. The Ranger will go for $285. I'll also be offering the Scout with a cord-wrapped handle. The handle shape is slightly different to accommodate the cord wrap. Price on the wrapped version will be $195. And here's the Scout prototype along with an unfinished Scout without the optional false edge. Afraid of Zombies? Well, the young lady who ordered this one isn't. Not anymore . . . .
A Goblin model specially modified for dealing with the undead, with toxic green paracord wrap and the heat colors from heat treatment left on. 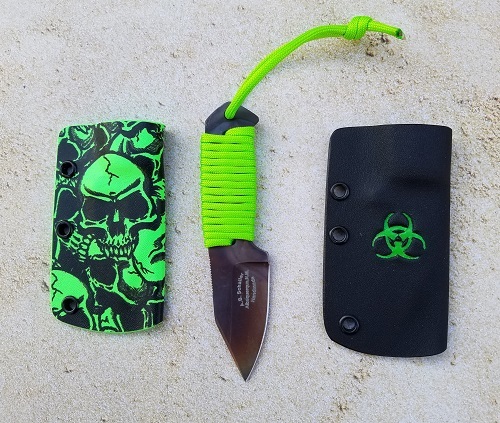 Two sheaths - a black biohazard sheath for everyday wear, and a toxic skull sheath for Sunday best. The crossbow is for Daryl -- The Python works for Rick. A shotgun filled with double-ought would be our friend Shane's pick. 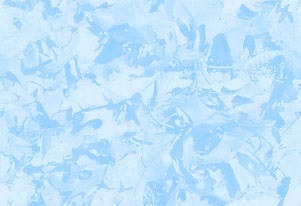 Iron - Cold Iron - is master of them all." Finally found time to finish this one up . 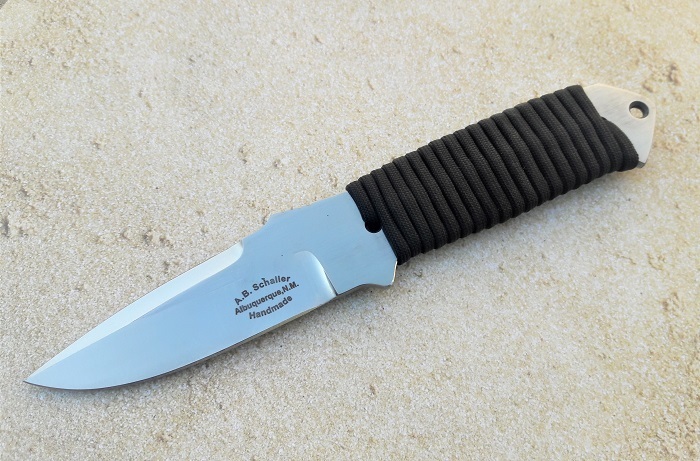 . . a classic Loveless/Archer chute knife. 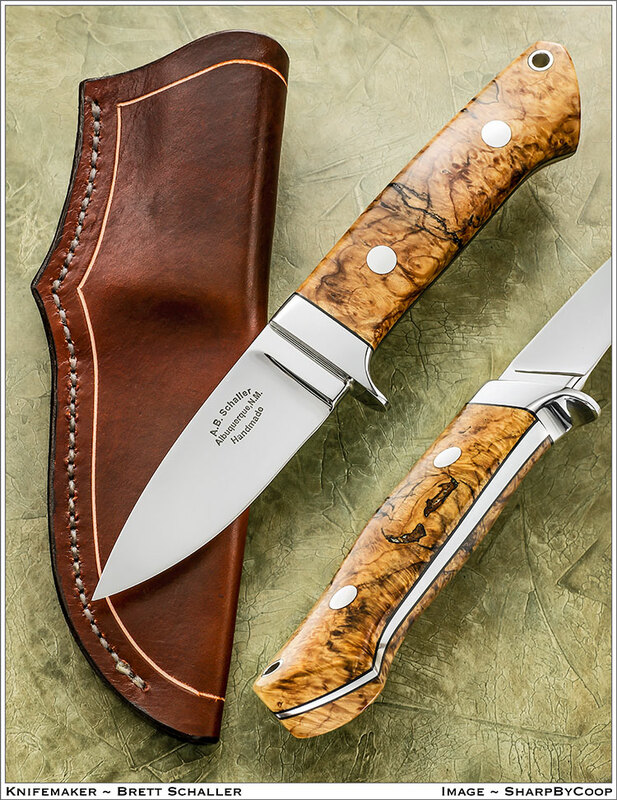 Mirror polished, with a stainless guard, antique ivory Micarta scales, and stainless/G-10 liners. 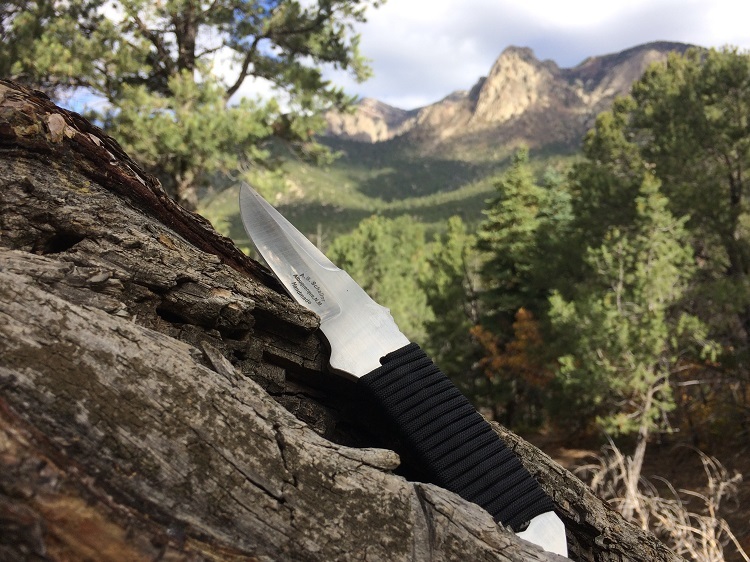 The gentleman who purchased the cord-wrapped Shadow prototype I recently had available sent me this beautiful photo of the knife taken while he was hiking in the Cibola National Forest. A wild knife in its natural habitat! First time in a while . . . I have some models on the shelf and available for immediate delivery on a "first spoken for" basis. 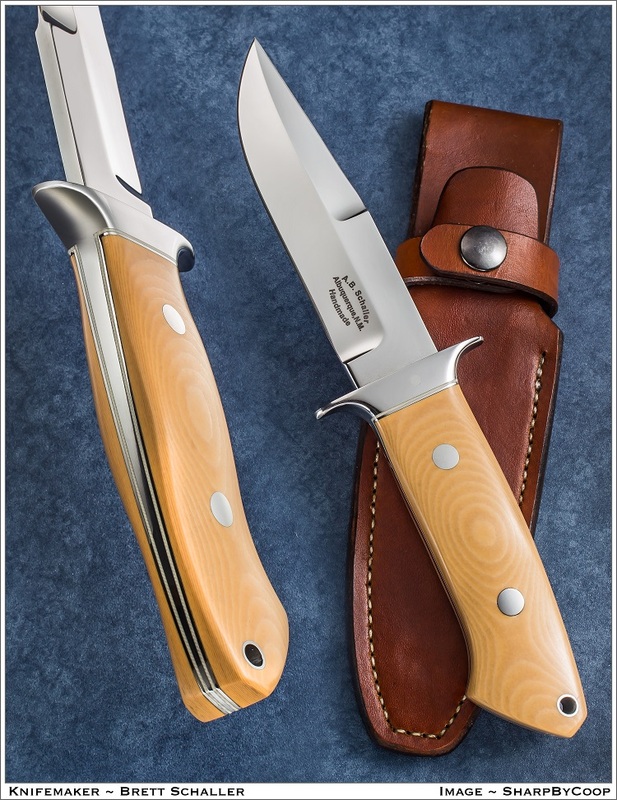 See the "Available Knives" page for details. Suppose you were a thief in an old style, fantasy Dungeons and Dragons style role-playing game. And suppose you acquired a broken sword blade. What would you do with it? 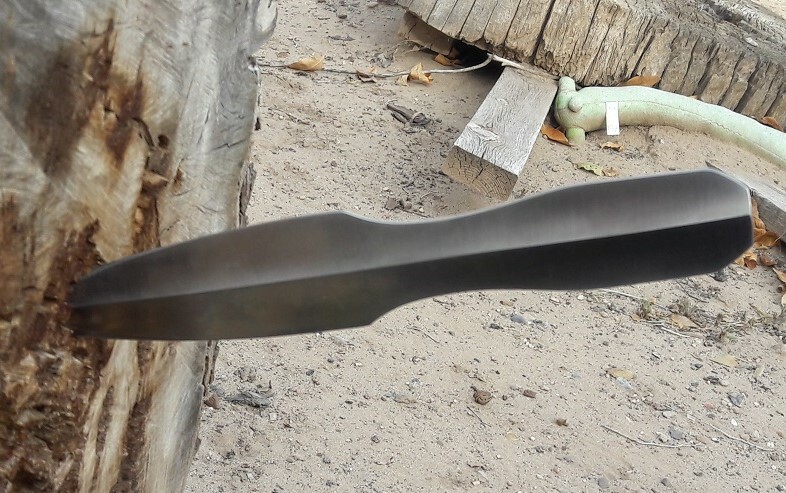 Why, make a throwing knife of course! This is made of 440C, ground symmetrically on both sides. It's not really a broken sword blade - just ground to look like one. 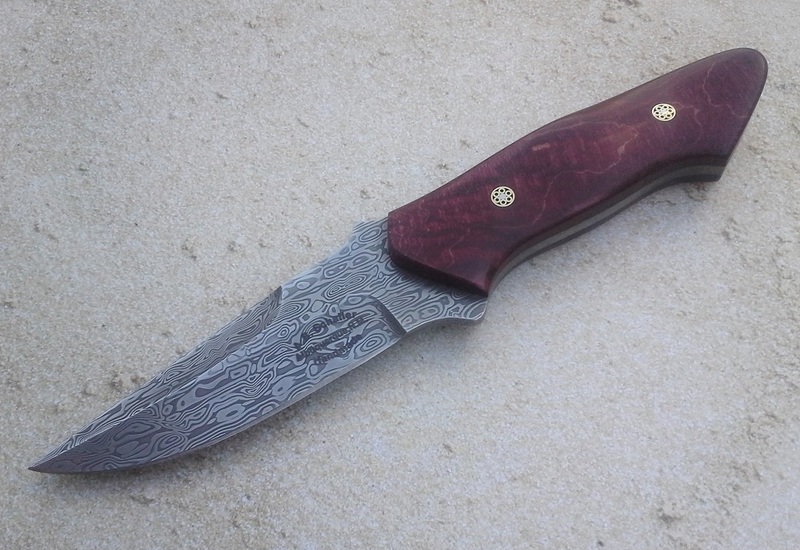 A Shadow in Damasteel and red-dyed maple. This is the first time I've worked with Damasteel. It's a bit more trouble than most other damascus, but the results are worth it. 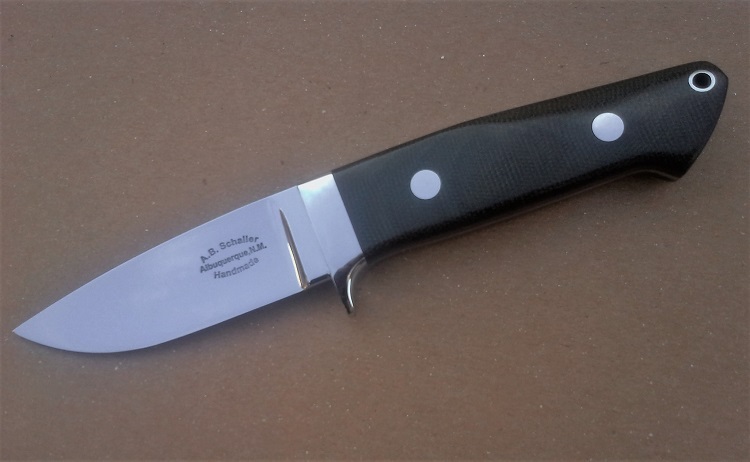 This knife also features a new style of mosaic pin. I've always preferred a fairly simple pin style, but I thought I'd branch out a little. This one features a brass outer tube with six brass hollow pins and a stainless center pin. As always, these are handmade in my shop - not commercial items. I'm calling this "mosaic pin style 2." Yep, I really had to brainstorm to come up with that name . . . . Here's another Loveless style dropped hunter - mirror polished with stainless guard and spalted box elder burl scales. Well, it's been a while. . . my computer finally died, and its replacement won't let me load my photo software. . . so I had to figure out how to take photos on my phone. As such, I'm having a little trouble getting good photos. Can you tell I'm not a tech guy? I still have a VHS player with the clock blinking 12:00. 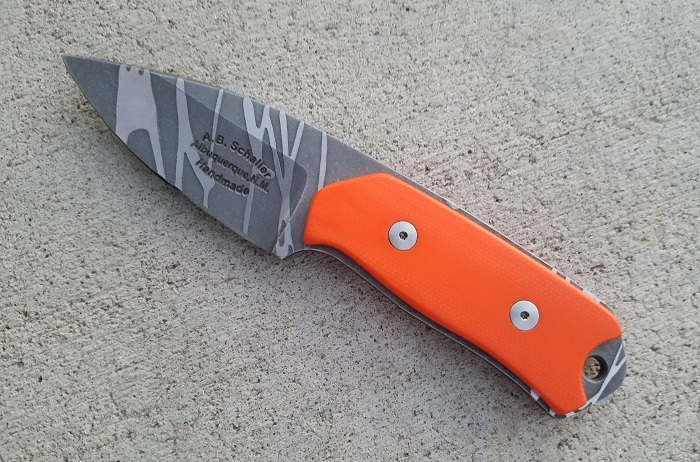 Anyway, here's one of the Loveless style dropped hunter blades from the last update all finished up. Green canvas Micarta with red liners, and mirror polished. 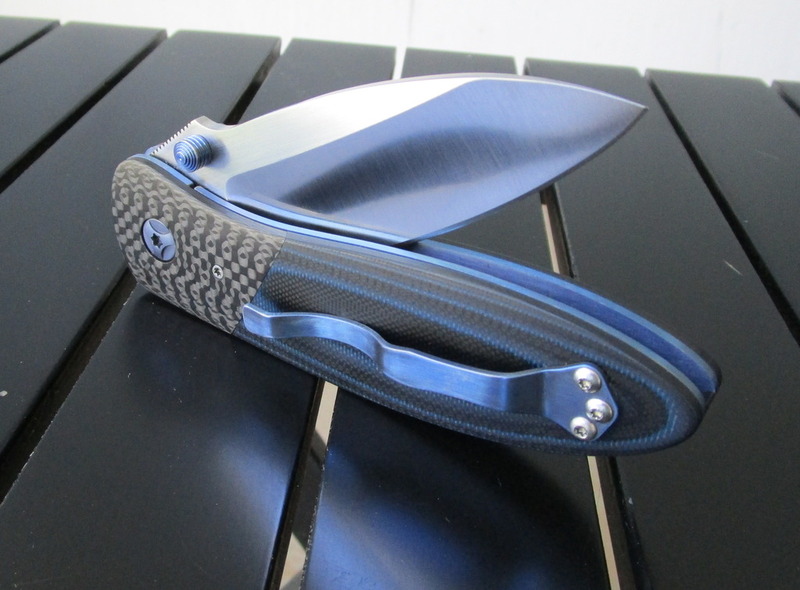 Here's a Nighthawk, locking-liner version with carbon fiber bolsters and blue/black G-10 scales. 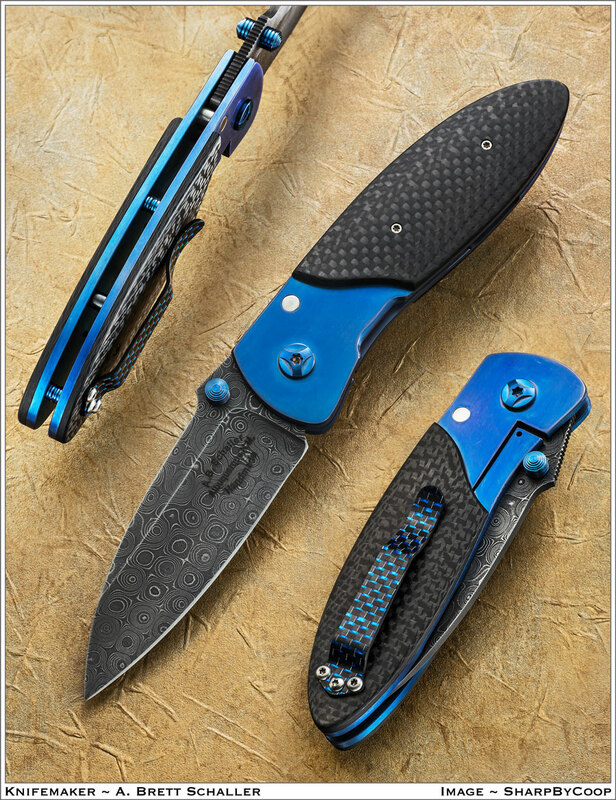 Just had Jim Cooper (SharpByCoop) take a very nice photo of this large model Nighthawk in framelock configuration. Blade is Mike Norris Damascus. 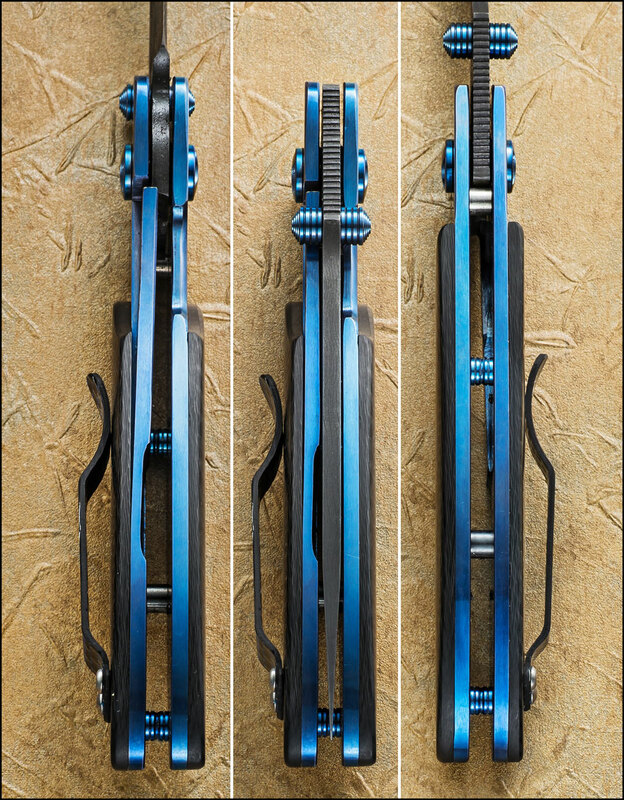 Liners, pivot and thumbstuds are all anodized blue. Carbon fiber overlays. Here's one of my older models that I wanted to make again - the SCS Special. 5 1/4" CPM154 blade, 10" overall. Hidden tang construction with a silver-soldered 416 stainless steel guard. 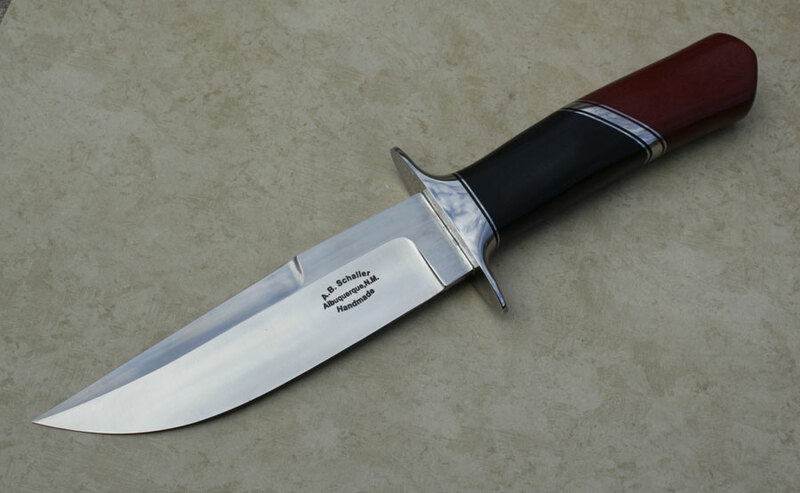 Handle is red / black Micarta with 416 stainless spacers. Hard to get a good photo because of the mirror polished guard and spacers. 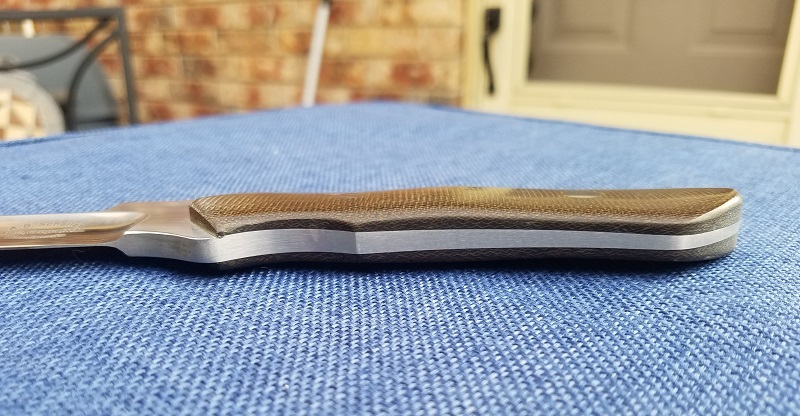 Copyright © 2019, Schaller Handmade Knives. All rights reserved.